This dataset contains power plants and their estimated generation across the world. Data for the individual power plants is provided by the dataset of the World Resource Institute (link above). Data on lower zoom levels is aggregated by the Energy Economics Group, TU Wien. Colors for individual power plants are determined by the primary fuel type of each power plant (fuel1). Colors for aggregated areas are determined by the maximum sum of each fuel type. 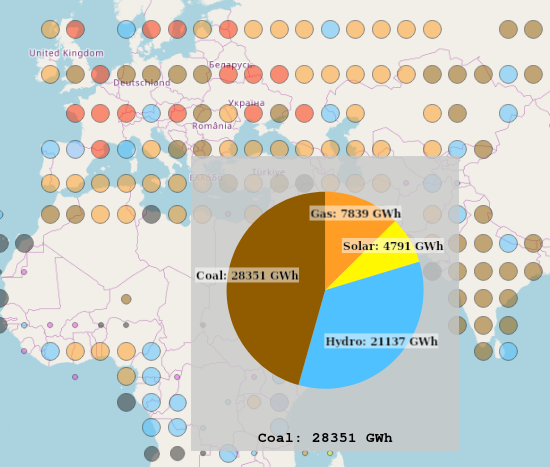 Click an aggregated circle to display the respective energy mix. https://maps.invert.at/global_power_plant_database. (2018, July 04). In Invert Maps Tool. Retrieved 02:54, April 24, 2019, from https://maps.invert.at/global_power_plant_database.